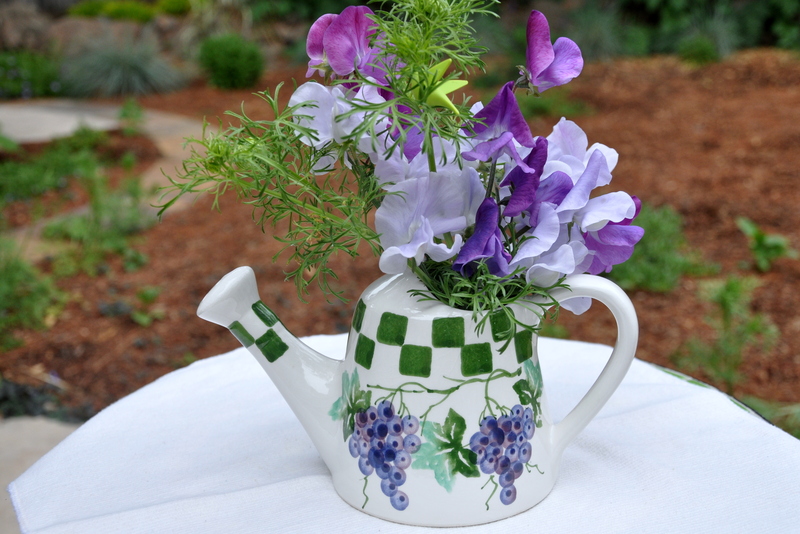 I continuously cut bunches of sweet peas to keep the plants blooming. When you live in sunny San Jose, the heat waves are inevitable. What’s new, however, is the duration. In the past, the temps would rise for three days, then drop back to a seasonal norm. Now they seem to last five to seven days at a stretch. With my fair, cool-weather complexion I wilt. Sadly, so do the sweet peas. 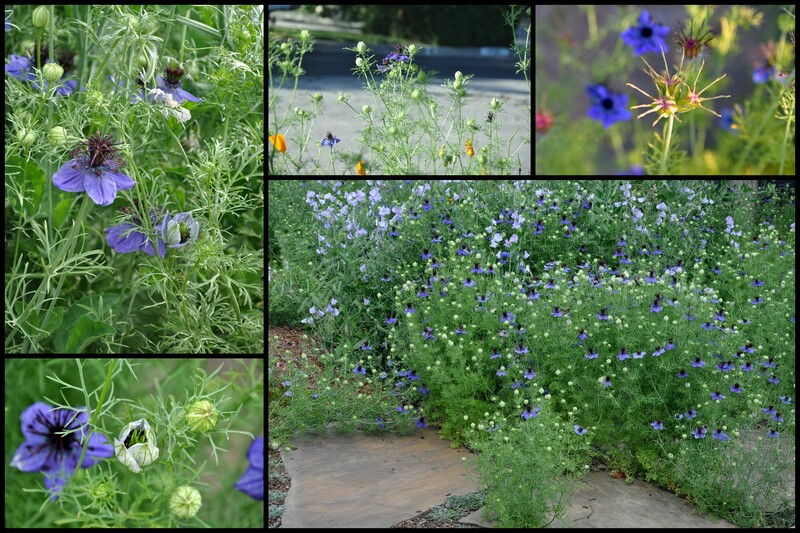 The Jungle, a self-seeded garden of Love in a Mist, Sweet Peas, California Poppies and Cornflowers in their prime. Snap, crackle pop. There’s beauty at every stage of the cycle. I’ve thoroughly enjoyed the jungle in all its wonder. Sweet peas self-seeded early this year, followed by love-in-a-mist and then cornflowers. All of the flowers are various shades of purple. I love the way they offered each other support. One by one though, they’re calling it quits for the season. Encouraged by Pauline, Lisa and Kelly, I cut blooms several days a week. Close up view. The tiny hummingbird is a wine glass charm, a gift from a friend. I found miniature milk bottles at a craft store for $2, wrapped the neck with purple baker’s twine, then filled them with fragrant blooms. 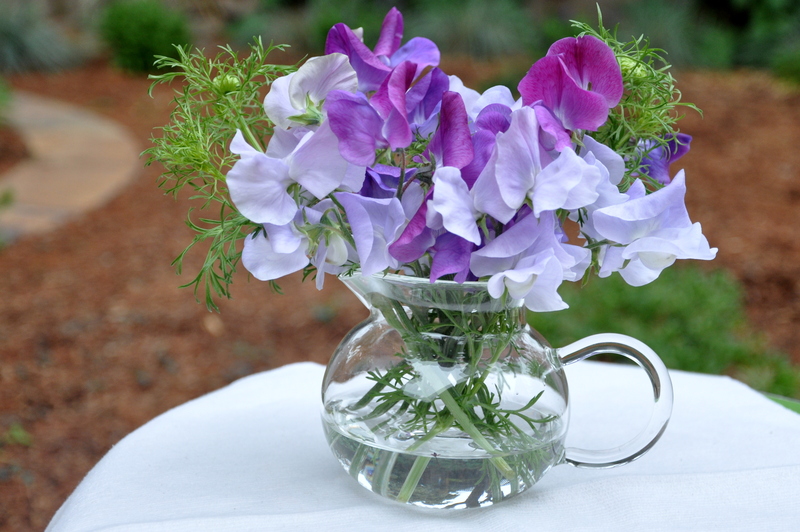 Sweet pea is the birth flower for April, and, coincidentally two of my Pilates classmates have April birthdays. I brought each of them a small bouquet. I enjoyed sharing them with friends and neighbors, and even brought a few to a client. Alas, the heat descended and the plants quickly dried and went to seed. Sweet peas prefer a cool 65 F (18C). We’ve had sustained temps ranging from 89 – 94 F (31-34C). I left them for a week till they were completely brown, then started pulling them out of the ground. I shook each plant liberally to drop any of the loosened seeds, then made a big pile to sort through on a cooler day. Ha! Days later, on an overcast afternoon, I sat in a chair in the middle of the pile and harvested seed pods. I learned a few things. If the seed pod is still green, the seeds need to dry before storing. The brown seed pods, fully encased, give up wonderful, dry, ready to plant seeds for the following season. 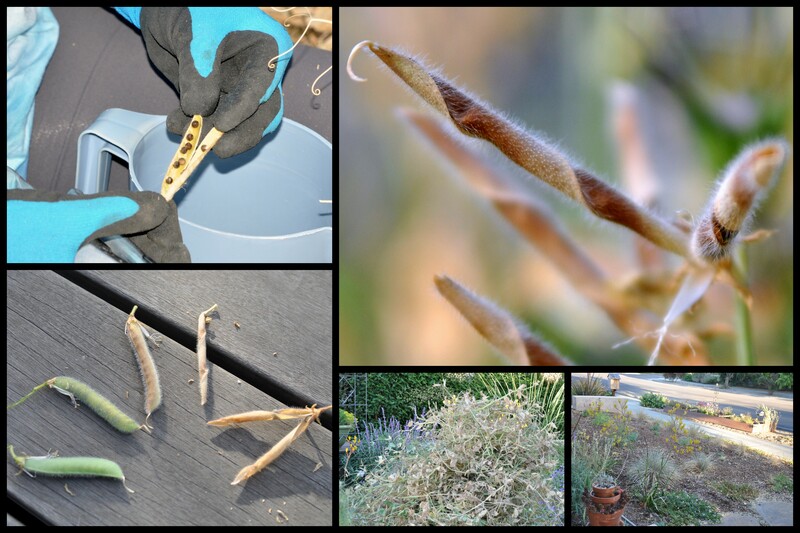 Harvesting seeds, upper left, a twisted seed pod squeezed out the seeds for next year. Different stages of drying seeds. The garden natives start to fill in. The most interesting for me though is what happens when the pods are ready to give up those seeds on their own. The pod cracks and then twists so that seeds are wrung out of the pod, dropping back into the soil for next year. That cracked, twisted pod has a beauty of its own. The birds didn’t seem interested in the dried seeds. 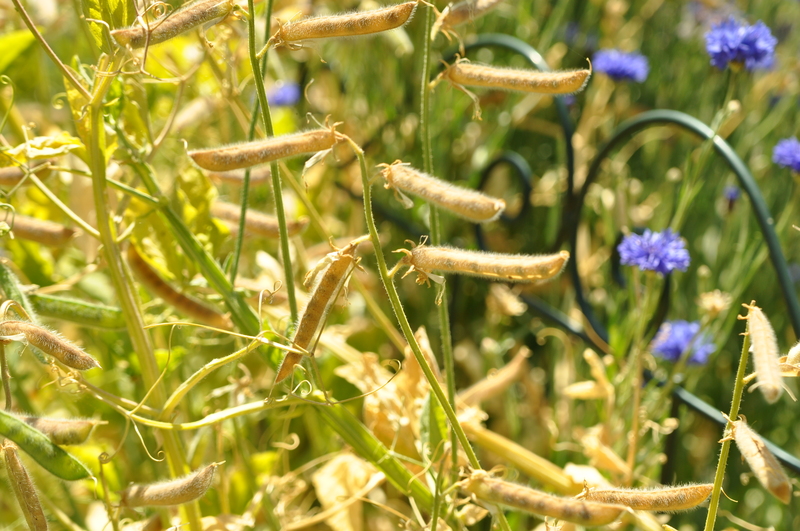 According to this Wiki article, unlike edible peas, the seeds are toxic. But here’s what happened the minute I cleared away the dried plants. 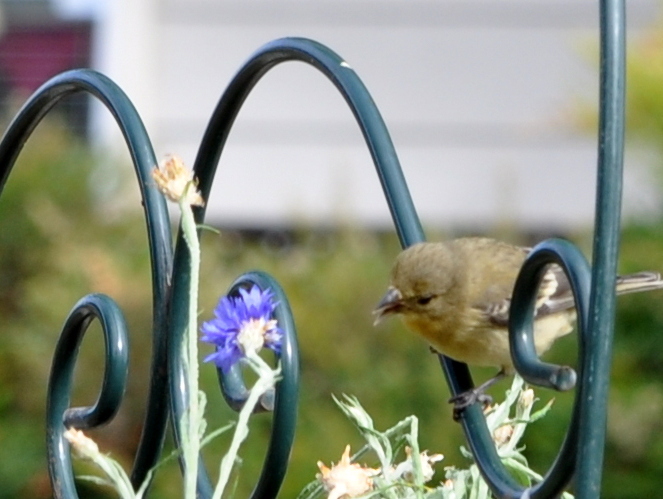 I propped up the bedraggled cornflowers and the birds flocked to the plant by the dozens. I could see three to five at a time eating seeds, but when something startled them over a dozen birds emerged from the plant. They may have been there all along, but with the love in a mist and sweet peas dominating the jungle, the cornflowers were largely out of view. It looks like they whole neighborhood stopped by. Aren’t they cute? That too has now gone to seed and I’ve gradually cleared away the last of the plants for the season. The garden looks a little bare without them. I’m also missing the bees that kept me company for weeks. Even the birds are scarcer than they were. Yup, it’s a hot, dry summer in San Jose. 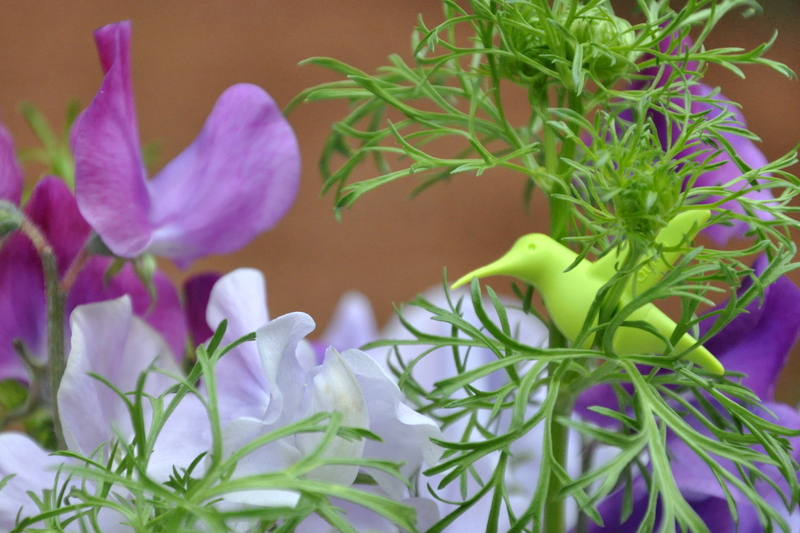 This entry was posted in Gardening and tagged birds eating seeds, cornflowers, growing sweet peas, love-in-a-mist, purple sweet peas, spring garden. Bookmark the permalink. Thank you, Cathy. It is sad to see them go, but I’m feeling hopeful for more rain next year and a repeat of those glorious blooms. Suddenly I become very aware of what a different climate you live in Alys – with summer just getting started you are cooking and your summer flowers are already setting seed and dying back. In my part of this country temps like that visit very rarely and not until late summer if they do decide to pop in for a day or two. Anything over 25C is sweltering for me and at that I take to my cool place – or the ocean – with a fan …… anywhere I can recline and moan gently. Luckily that heat doesn’t come often. No wonder sweetpeas do so well in my tiny garden – 18 – 21C is pretty average for ,most of the summer, so they flower for months and don’t usually set seed until autumn hits. PS Beautiful photos of the birds at work! Pauline, I’m happy to hear that you rarely get any super-heated days. They’re no fun at all. People head to the beach when they can, but given the congestion in the bay area, it often leads to gridlock on the highway heading “over the hill” as we call it here. Picturing you under a fan, moaning made me smile. You have such a way with words. The curb garden was an incredible gift. I made good and sure to shake, shake and shake some more, all those wondeful seeds. I’ve saved several sweet pea seeds as back up just in case. I’m glad you enjoyed the bird photos. Nature makes me so happy. 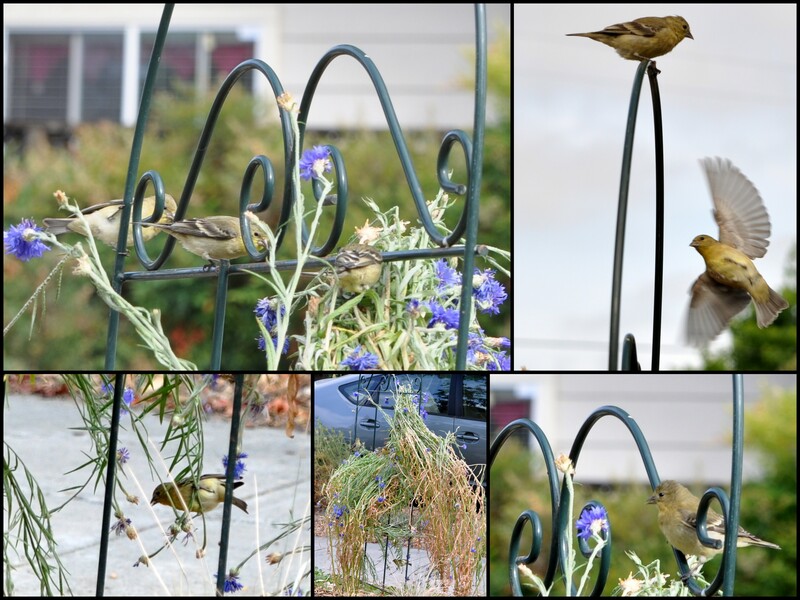 Those photos of the happy birds make me smile–they hit the mother lode of seeds! It sounds like you gear up, psychologically, for the worst of summer the way we do for the worst of winter. I always have indoor plans that I can enjoy while the wind screams and snow flies–you just need to do your thing while the AC screams! I’m not sure I’ve ever grown sweet peas and am now wondering if they would self-seed here and keep coming back. Our growing season is pretty short so if I had to plant seeds once the ground was warm, i don’t know if it would be worth it. Hmmmm . . . need to do some research. Stay cool! Kerry, aren’t those birds something? It was a joy watching them swoop in and out all day. I watched them from the kitchen window and the front deck whenever I could. I waited a full week before removing the last of the plants, to be sure they got all they wanted. I did the same with the love in a mist for the bees. We only have a portable AC in one room (crazy I know) so we try to keep the house cool by closing windows and blinds early in the day and running all the ceiling fans (we have four). I think you’re right about preparing for summer the way you prepare for winter. I enjoy walking in the evenings three seasons out of the year, but in the summer, if I can’t walk early, I’m often out of luck for the day. One AC unit? Yikes! I have that and I live where it never gets really hot! The website about the sweet peas is very encouraging because it says the seeds can be sown so early–a month before the last frost date. I’m going to bookmark this–thank you! Kerry, if Kelly grows them in Alberta, I bet you can get them going in upstate NY!! Yes, I hear you…wilting when the temperature rises. Summer is indeed for me too a time to get through, to make plans to ‘survive’ and not give in to the cabin fever…San Jose would be too much for me. At least here in Cincy we have the rains. better times will come Alys, this summer will pass too ;o) xo Johanna ps great photos! Thank you, Johanna. I’m happy to hear that you get some summer rain. That’s a welcome relief. I’m glad you liked the photos. It’s so fun trying to capture the birds without them noticing me. You’re right. That dried, twisting seed pod has a beauty all its own. 🙂 Here comes the heat…. I’m sure your summers are as hot and dry as ours are. Best of luck beating the heat. I like living in a place with 4 seasons, but my least favorite time of year is winter when everything is just brown. Spring, summer and fall, all bring beautiful vibrant colors to Southwest Virginia – so I understand the let down when things stop blooming and nature quits showing up at your garden. Thank you! I lived in Ontario, Canada till I was seven, and I too love the defined seasons. Virginia is beautiful country. You are lucky to live among all those trees, open spaces and the beautiful mountains. I hope you’re recovering from wedding preparations. You have made the best with what you have. Those beautiful volunteer flowers have made many hearts happy. I feel for you as the heat makes me wilt as well. People think I’m nuts because I love cold weather. I can handle that quite well. We are fortunate for now with a break in the heat and a bit of rain possible this weekend. Yay!!! I’m glad you have seeds saved for next year and I loved all the birds visiting your garden. Does make one happy. Have a lovely week and weekend and try to find a cool spot. Hugs. Marlene, I’ve always said that you can warm up much easier than you can cool down. Spring and autumn temps are my favorites, but like you, I don’t mind the winter either. I’m happy to hear you’ll have a break in the heat along with rain. Yippee! The better news is that our temps are about ten degrees cooler this week and breezy. 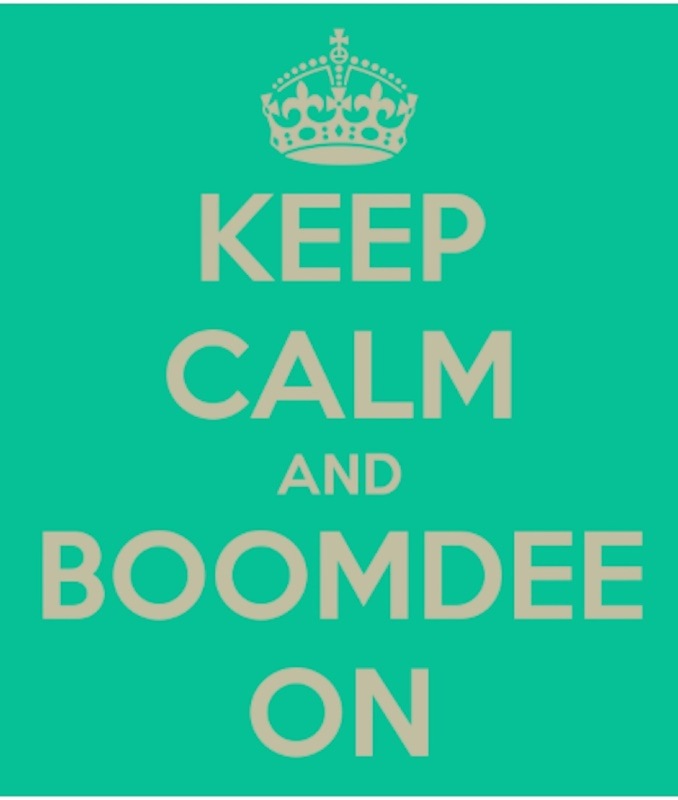 I have to add a caveat though, because warm and breezy are not a good combo during fire season. Fingers crossed that we get through these dry months okay. Oh no, Marlene. Is your DIL in Southern California? It’s been so dry there and the winds compound it. I’m sorry she had to evacuate. I can’t imagine the stress. No, the ex-DIL lives in the Arizona mountains. She was on pre- evacuation and they finally lifted it after a week or so. We did get rain and it’s cooler here than it’s been in ages. I love this weather. We had no rain last summer so I’m ever so grateful for the little we are getting this year. I’d love to send some your way. I read they found a huge aquifer somewhere deep underground in S. Cal. Getting to it is another matter. Dawn, our spring was amazing. So many years of drought made it especially wonderful. I loved the visits from the birds and the bees, and look forward to their return in numbers again next year. I think of them as a gift to the garden. When I’m working, with homeowners during these hot days, I cross my fingers that they have AC. I worked last week in an upstairs condo without it and came home with a terrible headache. I wonder if age makes you even less tolerant of the temperature swings? Ah, left when you’re north of 50! I hope you had a happy Independence Day and that your garden and projects are happily under way, Dawn. I always grin at your wonderful sweet pea garden and the fact that your climate keeps them from taking over. I rip them out so often because there get to be too many of them, but perhaps they are just in the wrong place!! It’s nice to see your garden in bloom and seeding as well. It’s so different with different climates. A couple years ago I realized I couldn’t even read the weather out west–here, cirrus clouds mean a fine day and rain in one or two. In Colorado, they’re just little whipped clouds! I think the birds might have disappeared because they’re moulting? I’ve just learned that’s what is going on here…. The only birds I see regularly at the moment are pigeons, and what a lovely sight it was in particular this morning. Two young couples, a boy and a girl each, sitting on the fence appearing to kiss their partner.